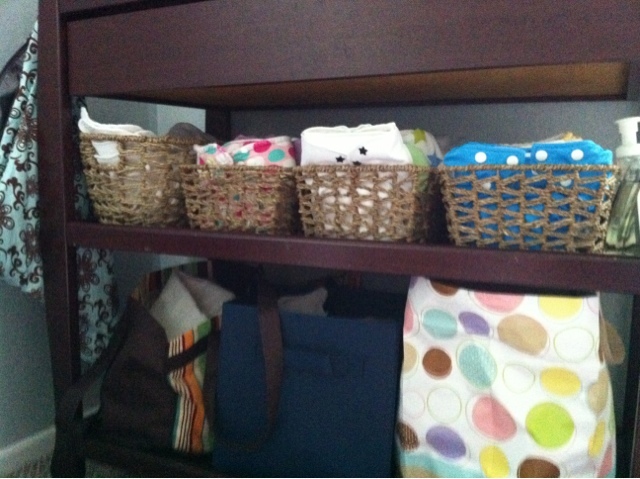 All diapers and diaper paraphernalia are kept in N's room, in her changing table. I love this table. With my son, I used an old card table covered with a sheet. My sister-in-law found this on Craigslist (a practically perfect match to the crib) for $20. Anyway, Inside the drawer is where I keep covers, wipes, snappis, pins, lotions, and rash cream... as I'm typing that I realize I probably should have taken a picture of the inside of that drawer... oh well. The top shelf is where all the real diapers are. 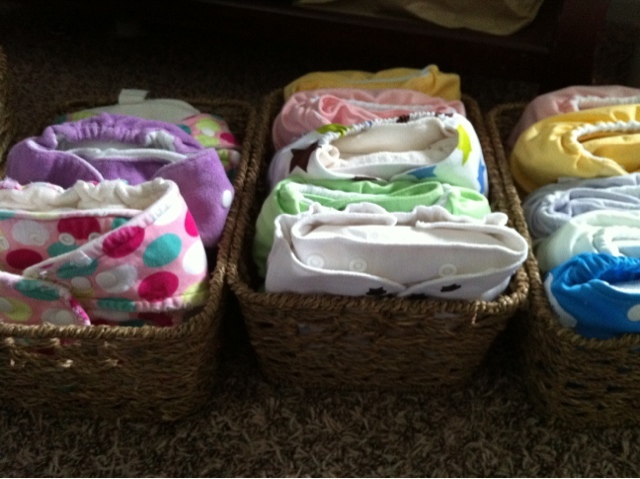 I have three rectangular baskets I got on sale from Joann's that keep all my pockets, all-in-one diapers, and fitteds. The larger basket on the shelf is what I keep all my inserts in (Flip Stay Dry and Organics, Econobum prefolds, and Thirsties Stay-Dry Duo). 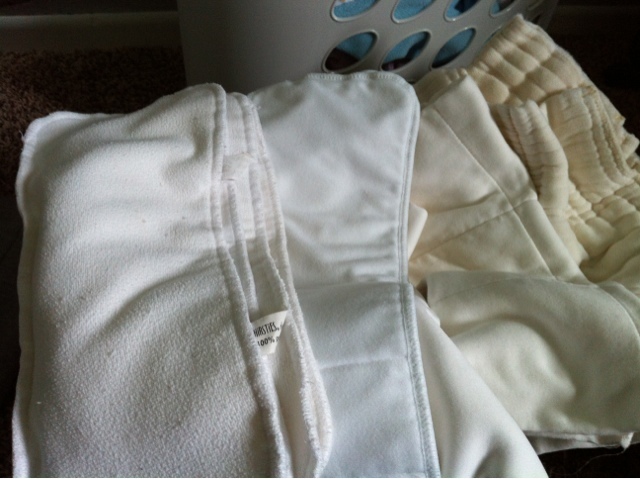 Before I tried fitteds, these were considered "nighttime" diapers. On the bottom shelf, to the far left, is where I've put all my flats for the challenge. 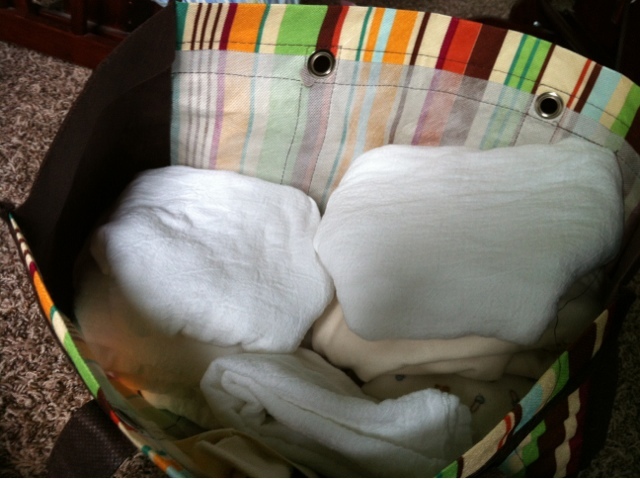 You can see I have a dozen flour sack towels as well as a hand full of receiving blankets. 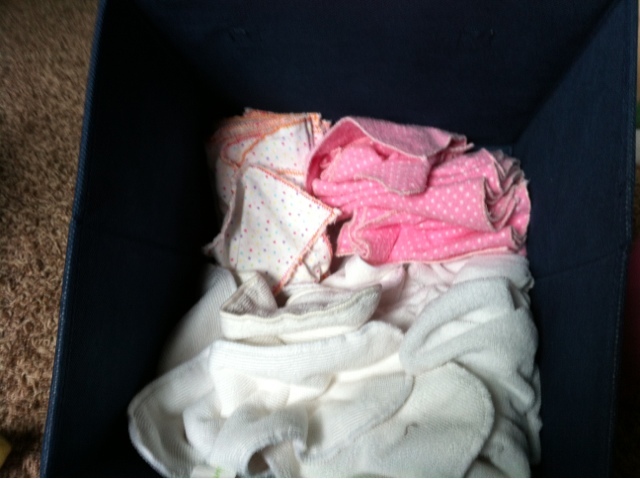 They're already folded, mostly kite and diaper bag folds. I also keep my fleece liners in here. The middle basket is a catch-all for microfiber doublers and homemade flannel cloth wipes. I also keep my extra changing pad cover in here. I didn't bother taking a picture of the last bag because, at this point, it's basically just filled with things I need to go through and get rid of... the "junk drawer" of my changing table, I guess. Not too shabby considering a year ago I only had 6 pocket diapers, three prefolds, two Flip organic inserts, and two covers. Eventually, I'll comb through this pile in more detail.